Okay it practically kills me to say this, because I really am about rescuing this sort of kid folk art… but, there are occasionally pieces I find that I simply have to leave behind. Now far be it from me to judge these pieces on physical beauty… and certainly at generally under $2 each, they’re not over-priced. But truthfully, space is limited in my tiny abode, and I find myself being very choosey when it comes to buying. I mean, I could buy every piece, pack it carefully away in a tub, and technically claim to have rescued it. But what’s the point in that? Saving it for the day when I open a museum? No, these days I find myself leaving behind pieces that don’t speak to me the way Little Ricky did, way back when I first started collecting. Anyway, my collecting has become much more careful – dare I call it curating… so I can personally enjoy each and every piece I buy. Here are, sadly, a few pieces I’ve recently left behind on the thrift shop shelves. 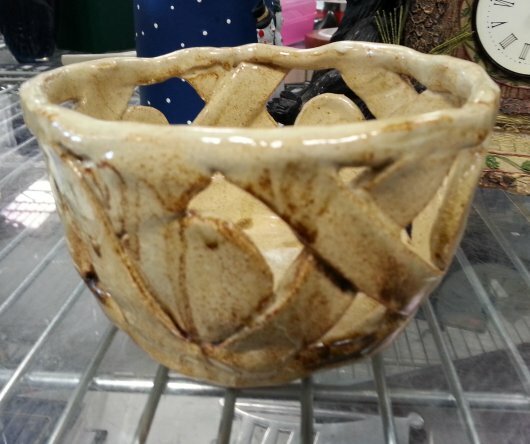 I hate leaving handmade pieces on the shelves. Maybe I should start thinking about that museum after all! I truly hope that Lori C.’s exemplary efforts in her art class were rewarded with a commensurate grade for her little trinket box – unlike my experience in art, where I was one day working on the best painting I had ever done when the teacher came over and swiped a swath of watercolor over the entire sheet of paper, from top to bottom, telling me, “Now it is more artistic.” Artistic – shmartistic, that jerk ruined my painting! 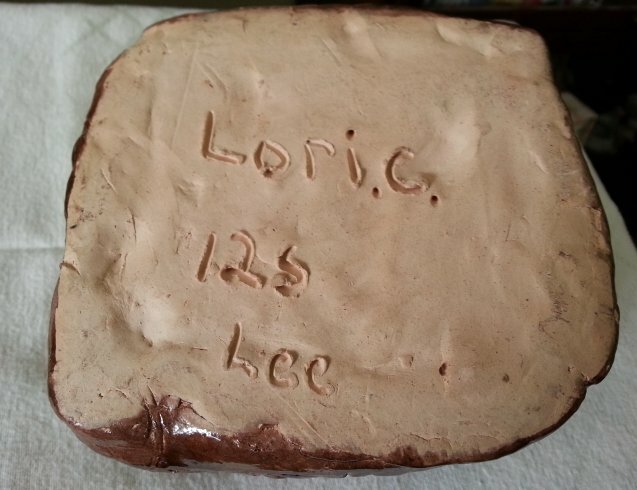 Anyway, no indications here that Lori’s teacher tried to tell her how to do anything but use her imagination. 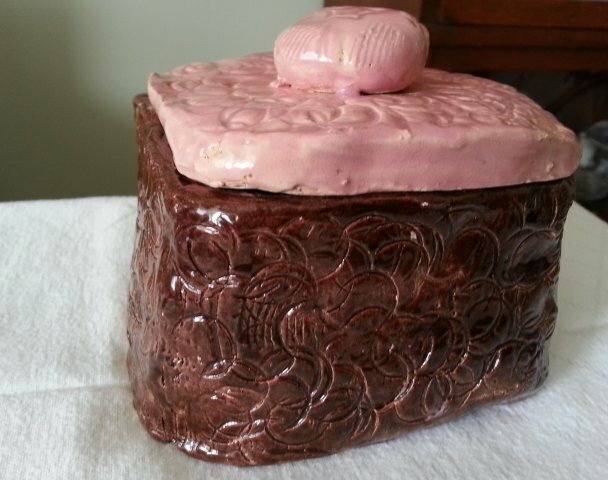 This rich chocolate-brown box with the pretty pink lid is covered with tiny circles and hash marks that give it detail and texture. The lid features a flattened ball on top so you can easily lift it off, and there’s a tiny star imprinted in the ball along with more circles and hashmarks. 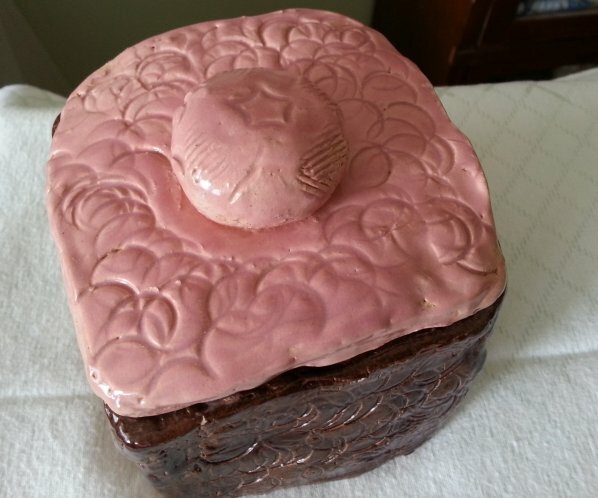 The pink from the lid is also used inside the box – it is almost a very soft coral color. The box itself measures about 4 x 4 x 5, and is made from the slab method – flat panels joined together. You can see a bit of the joinery on the bottom panel. And yes, the box itself is a bit off-square, but hey, cut Lori a break, will ya? This is elementary school, not the Masonic Lodge. 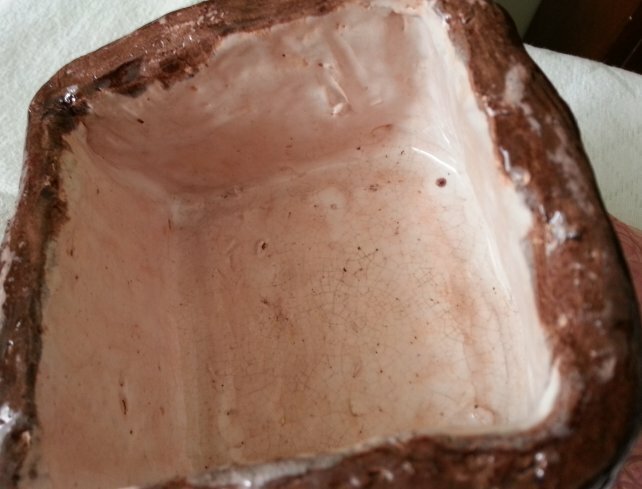 Also, note to art teachers: DO NOT try to “improve” your students’ work by smearing it with your own artistic vision. That sort of thing sticks with them for years. Decades, even. Best to just let the kid art happen as it will, and create your art on your own time. K-thx. I am sharing this sweet project for Pink Saturday. 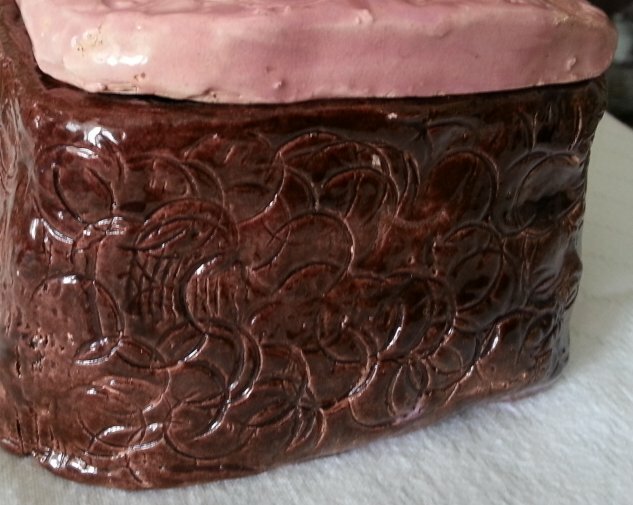 Many more delightfully pink posts at Beverly’s lovely blog, How Sweet the Sound. 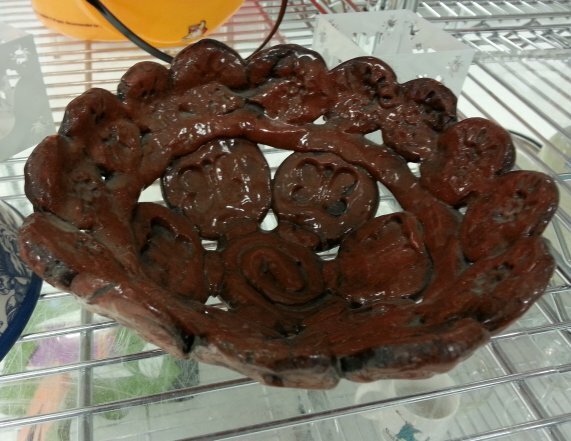 I am so happy to share the first-ever reader submission on Your Clay Project! And not just because the featured project is ADORABLE, but also because of who made it. Have you ever been in a flood? And by “flood” I don’t mean a couple inches of burst pipe water in the basement. I mean, the basement is full of THE RIVER and by the way so is the living room, and all it’s foul-smelling, bacteria-infested, dead-fish-floating, mixture-of-river-chemicals-sewage-and-oh-my-god-the-stench-will-never-leave-my-nose FLOOD. Well, I’ve been through that kind of flood, twice. And let me tell you, clean-up from this type of ordeal is quite simply overwhelming, physically and emotionally. And in 2008, when it was Day One of clean-up, who was there to help? A guy named Howard. 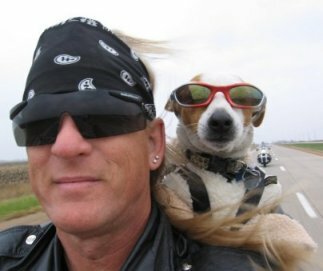 A great guy, a motorcycle buddy. The kind of guy who would do anything for a friend. Including haul a muck-filled mattress out of a muck-filled house, and squish it, end over disgusting end, out to the curb. Including fearlessly climb over the pile of debris into our tiny former office and scoop out how many shovels full of slimey ruined books and other wretched, stinking debris. Including so many more gross, God-awful clean-up tasks, that you could never ask anyone to do, but they just step in and do them because they’re your friend. Anyway, short version: I love Howard, he is a dear and treasured friend. 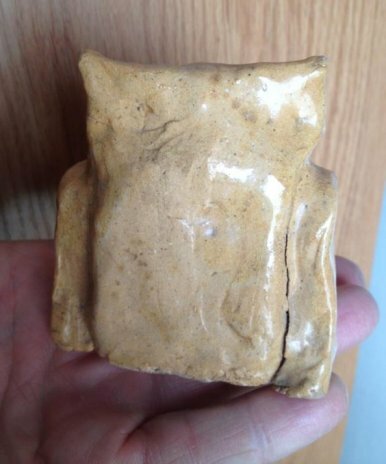 And he was 8 years old when he fashioned this little owl figure in elementary school art class! It features sturdy, chunky wings, button eyes with a hypnotic starburst pattern, and a charismatic beak that protrudes out and down, giving it a personality much bigger than its 3 x 3 x 5 inch size. The year was 1968 and when the owl was complete, Howard gave it to his dear grandmother – who must have immediately mailed off a picture of it to iconic TV producers Sid & Marty Krofft, because I’m pretty sure they used little Howard’s project as the inspiration for the Witchiepoo character on “HR Pufnstuf” (a show that was not LSD-induced in the slightest, so please do not spread those rumors). Well at the very least, Grandma kept it and cherished it and dusted around it for decades, until she passed away in 1991. At that point Howard lost track of it. Then about seven years later, the little owl re-surfaced – Howard found it at the home of his uncle in 1998, after the uncle’s passing. So it seems that our cute, wise little friend has a way of turning up when it’s unexpected. Just like Howard, who turned up on Holcomb Street ready and willing to haul the muck out of our flooded house. I’m so glad that Howard and his little owl have been reunited! 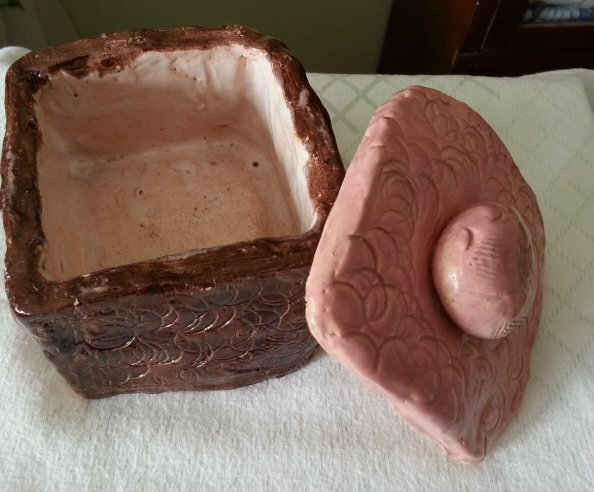 Have a clay project you’d like to share? Just email me a few photos and the story behind your piece at submissions@yahoo.com. I’m linking to the What’s It Wednesday Party over at Ivy and Elephants, and also to Vintage Thingy Thursday at ColoradoLady! Click through for tons of inspirational projects, and of course wonderful vintage thingies! You know how you love some antiques because you shopped for them patiently and finally acquired them yourself, maybe after years of hunting… and other antiques are just a little more special – treasured just a little more – because they are family pieces, handed down through generations or simply given to you by a family member? 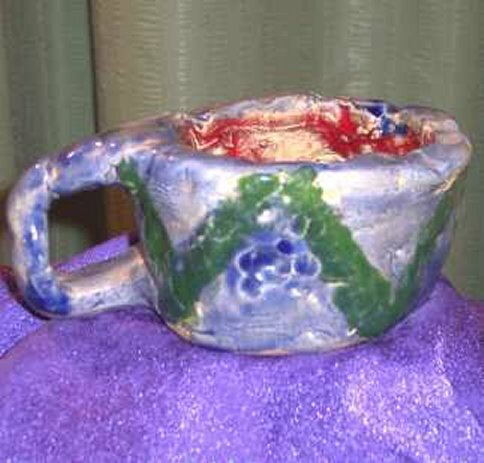 This little coffee mug is one of the “family pieces” in my clay project collection. 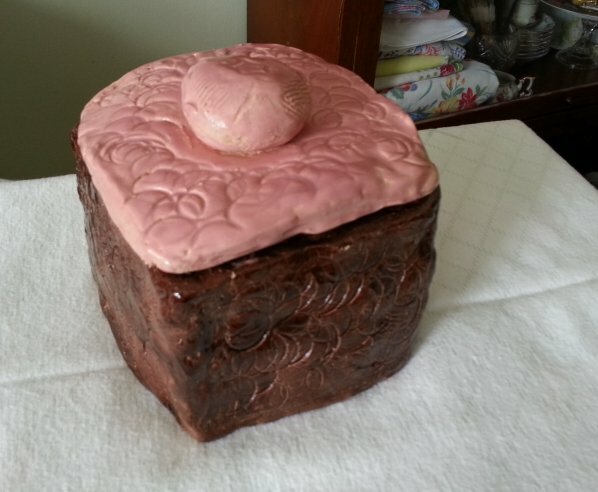 It was made in 1986 by my step-daughter, and given to her dad as a gift along with an ashtray. 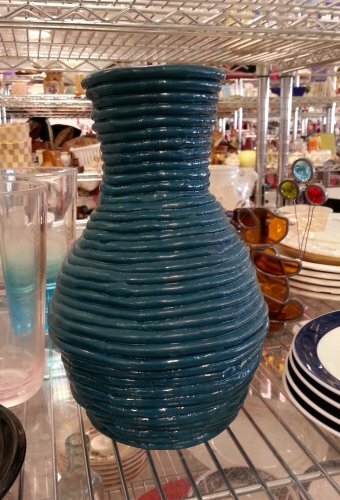 The bold green design on blue glaze is really rich-looking in person. 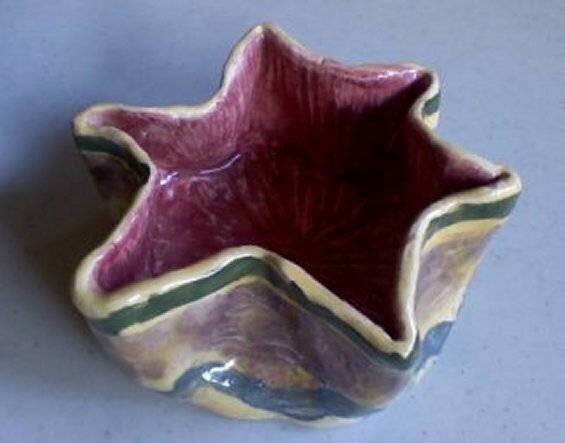 It measures about 2 inches tall and 4 inches across including the handle. And yes, I will take a moment to apologize profusely for the hideous photo, especially the combination of the green seersucker shower curtain in the background and the shimmery purple “bed” of fabric. This photo was taken for the original Your Clay Project website, back when my merchandising aesthetics had not really evolved. So… yeah. This cheerful little star-shaped dish is just the kind of thing I like to find at the thrift store, hidden amongst the faux-Victorian soap dishes and the “I Love You Bear-y Much” figurines. 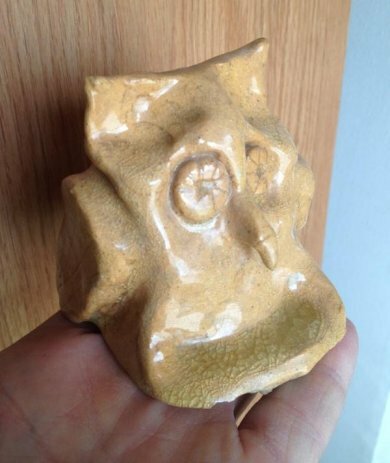 It’s not really good for anything… its small size (about 3 inches across) and the odd shape make it almost useless for storing anything – or at least, for retrieving anything out of its depths. But the soft yellow base color with cool blue, green and purple stripes… and the mulberry color inside, make it impossible to leave behind. Perhaps if Vincent Van Gogh (referenced in the title of this post) had seen this little dish, his attitude would have improved and he’d still have that ear. Which, coincidentally, might be the only thing that really fits in the starry, starry dish. What's this site about? 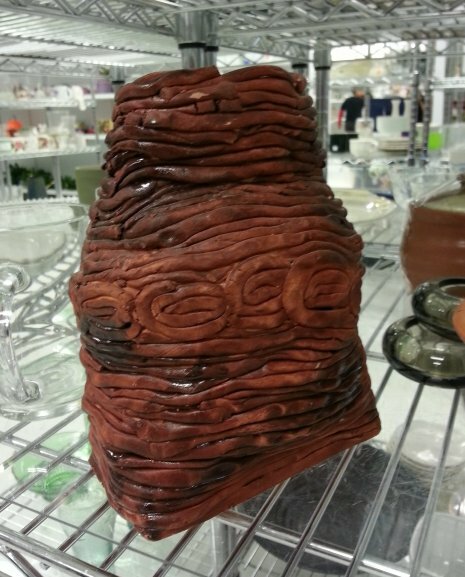 It's about showcasing found, collected, and treasured kids' clay projects! Read the "About" page to get the full scoop! I prefer to showcase kid-made projects, but grown-up projects are ok too as long as they show homespun goodness instead of professional artistry.